In their truth-seeking and public service, many journalists risk their lives reporting in some of the most dangerous places around the world. In many cases, they are arrested, detained, reported missing, wounded or even killed by terrorists or armed forces, who target them deliberately. 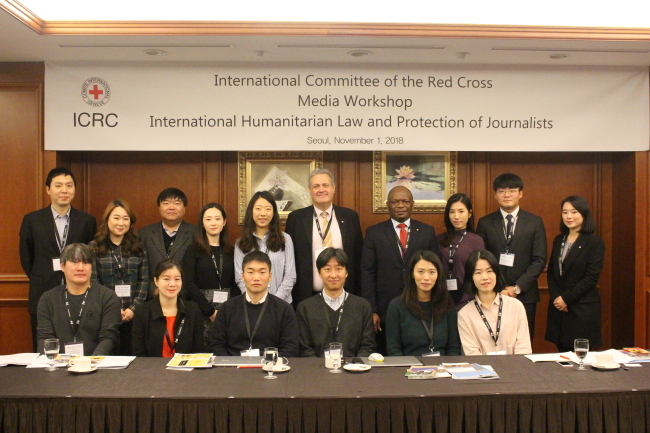 To help media professionals understand the perilous landscape they often operate in and better protect themselves, a workshop on international humanitarian law was held in Seoul on Thursday. Senior journalists and communication officers from humanitarian organizations in Korea participated in the conference organized by the International Committee of the Red Cross mission in Seoul. They learned about rules that regulate how war is fought as well as ways of safeguarding themselves in fields of operation. The ICRC -- the world’s oldest humanitarian organization established in 1863 in Geneva with four Nobel Peace Prize winners -- has established an emergency hotline (+41 79 217 32 85) and email (press@icrc.org) to assist any journalist in a jeopardous situation. The hotline allows prompt and effective action by seeking confirmation of a reported arrest or capture; obtaining access to a detainee; providing information on their whereabouts to next of kin or employers; helping family members establish contact with the detainee; evacuating the wounded; and recovering or transferring their remains in cases of death. Around the world there are over 66 million forcibly displaced people, 23 million refugees and 10 million stateless people, the United Nations High Commissioner for Refugees tallies. Nearly 20 people are forcibly displaced every minute as a result of conflict or persecution. As an independent institution with over 17,000 staff, ICRC operates in over 80 countries around the globe, including North Korea, with a mandate to help people affected by conflict and armed violence as well as implement international humanitarian law. Under international humanitarian law, media professionals working in armed conflict zones have the same comprehensive rights and protections as other civilians, so long as they do not participate in hostile activities. By knowing and referencing humanitarian law, journalists can enhance their reporting, better protect themselves on the ground and also enhance understanding of armed conflicts, humanitarian crises and work done by ICRC and other humanitarian organizations, according to the institution. The ICRC’s Seoul office, which opened in March 2015, has promoted dialogue between Korean diplomats, politicians, scholars, researchers, police, military officers and soldiers for political, financial and manpower assistance. It also raises public awareness of its activities and conflicts worldwide, alongside educating professionals on humanitarian law. The Korean government and ICRC signed a headquarters agreement in Geneva on Feb. 26 to give the institution legal recognition in Korea.